"For steel string guitar," fits almost all acoustic and electric steel string guitars. Crafted of solid stainless steel to resist nicks and scratches, this capo will look just as beautiful years from now as it does today. 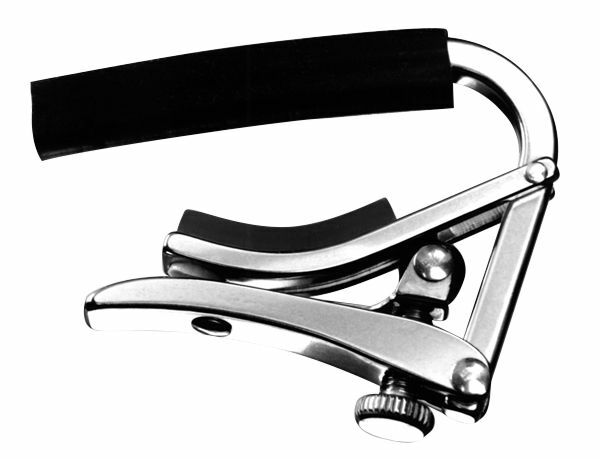 When the Shubb Capo was first introduced in 1980, capos were elevated to a whole new level. In 1998 the Shubb Deluxe pushed the envelope again. Many people thought that the original Shubb could not be improved, but with the Deluxe we introduced upgrades in materials, design, geometry and ergonomics. It became the flagship product of our line. Still made in our shop in Missouri and assembled by our crew in California, as it always has been.